I hate to hear people trash-talk potatoes. I once had a friend sniff, “I don’t consider potatoes to even be a vegetable” and I rolled my eyes and flipped her off (which, okay, I could do because I was actually online chatting with her at the time). Potatoes, in my mind, are pretty much an absolute good and I feel rather protective towards them. Remember a couple of years ago when food prices shot up and then suddenly staple grains were all crazy expensive, and there were protests and riots in parts of Africa and Asia over food prices? Well, that’s what globally-traded food commodities can get you. Rice, wheat, and maize are the top three sources of carbohydrates in the world and they’re all subject to price fluctuations, but potatoes don’t keep well enough to ship very far, so they’re not globally traded—which is great news if you live in a developing country and you’re now royally screwed because rice/wheat/maize is now too expensive for you. Potatoes can be grown by almost anyone, anywhere, in any country. So long as you have dirt and people to water said dirt, you’ll get potatoes and you’ll get fed. But here in the rest of the world (I hear you say), we don’t have that problem. Okay, I will give you that. But potatoes are still my food hero. Potatoes are so cheap! Seriously, even for locally-sourced potatoes, they’re still a bargain. They’re solid through and through, so no seeds/skins/rind/tops that I say I will eat and then never do (sorry, beets) that will go to waste, and they keep nearly forever. Potatoes are fat-free and cholesterol-free. They’re a good source of dietary fiber and are surprising high in protein for being a root vegetable. And! 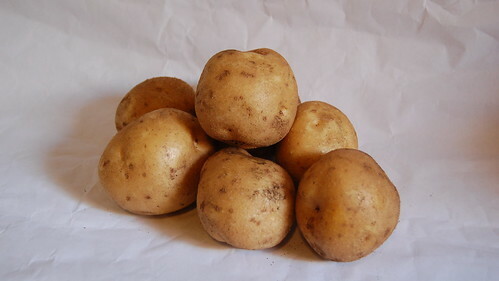 They’re a good source of potassium and vitamins B6 and C.
Although I like to use roughly equal amounts (by weight, not volume, because the kale will cook down a lot) of starchy potatoes and kale, you can use more potato than kale if that’s how your fancy strikes. Cut the potatoes into chunks and bring to a gentle boil in enough water to cover them. Wash and shred the kale while the potatoes cook and by the time you’re done, it’s probably a good time to add the kale to the potatoes. Once both are cooked to your liking, drain and add about a half-cup of milk and couple tablespoons of butter—more or less, depending on how moist you want this to be. Ideally, you’d eat this with a smoky sausage, like a kielbasa but it’s pretty good with almost anything. I’m going to make some Boerenkool Stamppot right now! Yay! It’s surprising good the next day, too. I sometimes whoosh an egg into the leftovers and fry them like latkes. OMG – I can’t wait to make this. Thanks for sharing. Yea! Thanks for reminding me of the Stamppot. One of my favorite meals in Amsterdam. 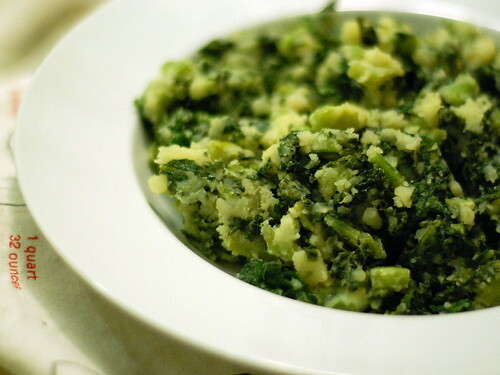 Such a good winter dish as the potatoes are comfort while the kale is so nourishing! It might help me get over my recent addiction to risotto. Did you find a restaurant serving stamppot in Amsterdam? The times I’ve been there, I felt like it was all rijsttafel and doner kebab places everywhere I looked. Oh, and pizza. Horrible, horrible pizza. Love your blog; I found it through The Blue Kitchen!